You might not yet realize your natural work preference, but it’s there. 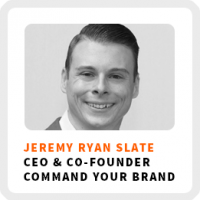 Jeremy Ryan Slate easily has one of the most prolific career paths of anyone I’ve interviewed! He’s accomplished a diverse range of work in his career as a teacher, powerlifter, network marketer, selling insurance and content market to name a few. Looking back at all his work experiences, he realized he always gravitated toward an education role in his work. That’s the thread that ties all of his diverse work experiences together. He’s the CEO and co-founder of Command Your Brand Media, an agency that helps leaders boost their influence through podcasts, as well as develop the skills they need to be a star in their niche. He also hosts his own podcast, Create Your Own Life. The lessons in this episodes are fast-paced, so pay attention! Why Jeremy thinks his near-death death experience didn’t have much of an impact on him and why he did have an inflection point when his mom nearly died. The pros and cons of network marketing. How he got comfortable with sales by making 50-100 phone calls per day. His two most important pieces of career advice: learn from people doing what it is you want to do and stick to one thing and see it through. Core work activities + habits: 1) Record podcasts. 2) Create content. 3) Hire new people. Ideal work environment: Usually when he’s traveling. Superpower: Intuition to help predict what might happen before it does. Definition of success: Building the company to being a million-dollar brand. Self-reflection practice: Finding people in his circles that will give him honest feedback about what he’s doing. Regains focus by: Listening to Grant Cardone audio tracks. 1) Make use of meetup groups that are based on common interests rather than networking groups. 2) Use something like Meetup.com to find groups and connect with like-minded people. Thanks for listening! Enjoy this episode?